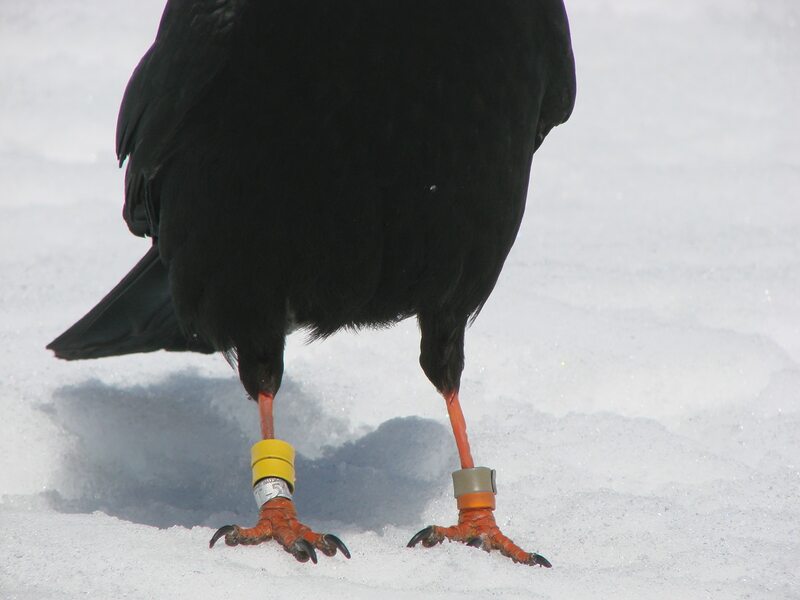 The director of the Centre for Research on Ecosystems at Altitude (CREA), Anne Delestrade , wrote a thesis for her Phd on the yellow-beaked alpine chough – alias Pyrrhocorax graculus. 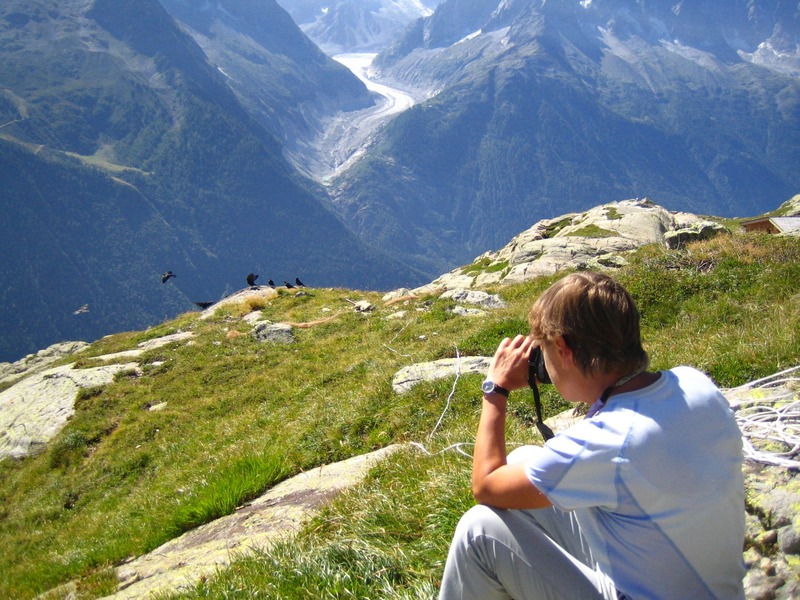 Since then, she hasn’t stopped pacing the massifs which dominate the Chamonix valley to study and count this benevolent companion of the high peaks. She agreed to answer a few questions in order to present this beautiful shimmering black bird which personifies the mineralogical environment of the high mountains. What are the origins of this bird ? Anne D. : To start with it is a member of a very amusing family, the corvids, which includes, crows, magpies, jays… very smart birds who, in comparison with other species, have behavioural traits which are well developed. They all have a part of their lives which is very sociable, but the chough is sociable all its life. All year round and all throughout its life it lives in the midst of big groups composed of hundreds of individuals. A lot of corvids, like the crows, stay as a group when they are young, as long as they are not breeding, then they pair and stay within a territory. As for the chough, they rest with numerous friends from the beginning to the end of their lives. 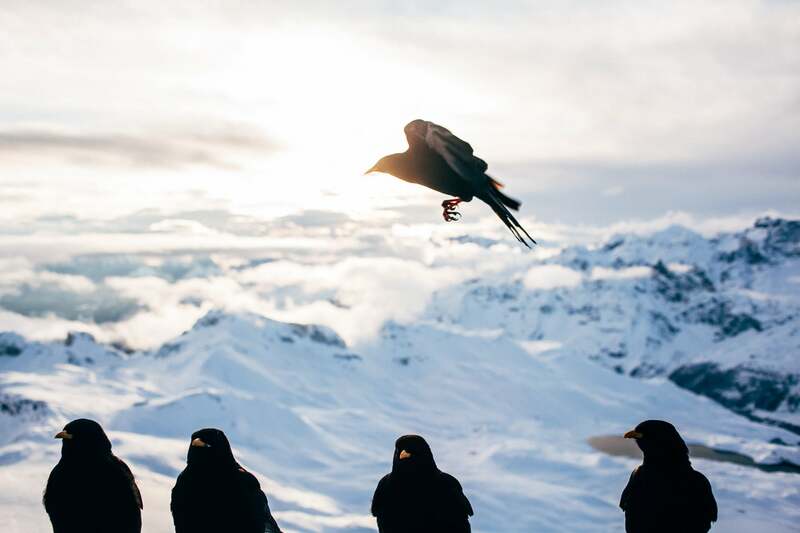 So they give many signals, many behavioural and of recognition, social interaction… And its really entertaining, above all with a species which only lives at high altitudes. Where can one find them ? Anne D. : The species is present in all mountainous massifs, as one might say, the ancient world. They are not present on the American continent, but in the big mountain rages of Europe, Asia and Northern Africa. What is their preferred habitat ? Anne D. : They need alpine grasslands. They live in open spaces so above the forests, in zones where there is grass and there are cliffs. There must be both because they nest and sleep in the cliffs, in cavities and they feed in the grass, not too high, where they can find insects and berries. They eat a bit of everything, they are not choosey, one can see that when they eat tourist’s sandwiches ! This absence of a strict diet also participates in their capacity to adapt. All species which have a restricted diet have more trouble in changing their habits.They adapt to many things. They live to be so old ? Anne D : On average they live for 10 years because there is a high infancy mortality rate. Globally, only half the young survive the first year. After that there are ten percent which die. So if they get through the first year… phew. There is a renewal of the adults of 10-20 %, which is already enormous. When you ring 100, you will loose 20. It is for this reason that you need to ring them all the time if you are going to follow them long term. And in your groups, have you seen the population diminish or increase ? Anne D. : It’s difficult to say because they are big groups which move around together, but I rather have the impression that there has been a decrease in numbers these last few years and I think it is linked to human activity, like the decrease in the frequentation of the high mountain huts. In certain areas, there are noticeably fewer choughs because there are fewer attractions which in turn harms the production of the young. The adults are going to care of themselves because they are not birds which depend on man. Their basic food is natural. Human rubbish is a plus. In the autumn and the spring the resorts are closed, there are not many people and its not what they can rely on. So unless rubbish is put out all year, that is not going to change much. At the beginning of my studies, there were rubbish dumps around which were open to the sky. Sometimes they flew 30km just to go to a rubbish dump. In these areas there was some grub, this had an impact. This seasonal support had an effect on reproduction and eventually the survival of the young because it was easier for them to find food. But reproduction didn’t evolve by very much. It created more birds, but they didn’t all breed because that depends upon the capacities of the nesting areas. There is not only a housing crisis in Chamonix , but up there as well (laughter). Cavities that are well sheltered and deep are limited in number. In general, the cavity is always defended by the same couple. Therefore they have to wait for a bird to die in order to replace it. But otherwise all the good holes are occupied. 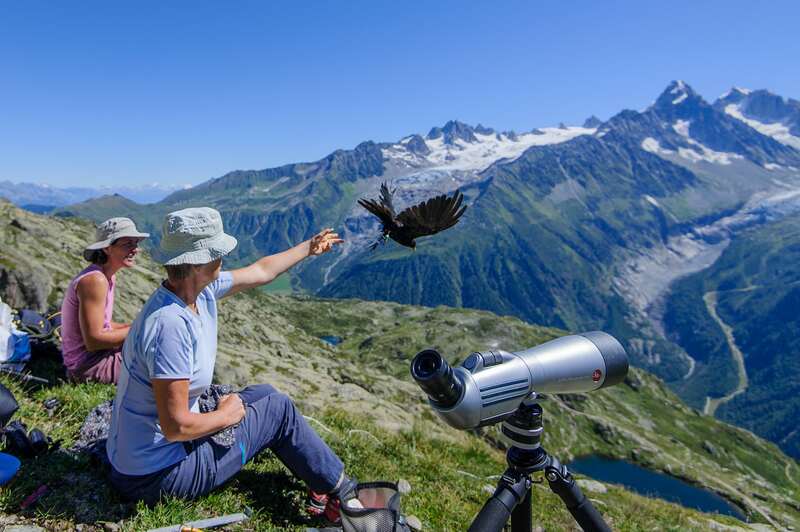 How many choughs are there in the massifs which overlook Chamonix ? Anne D. : There are around 350 individuals which move around the valley. If the partner of a couple dies what happens to the other bird ? Anne D. : Actually, they are faithful for life to their partners, but only while the partner is alive. Once they have died, they take another partner. That is also original. They live in groups where there are many possibilities of finding the best partner, but they don’t change them. So if they fail to breed, they could change. But no, they remain faithful. I think there is an interest in staying with that which you know best in difficult environments where the weather conditions are primordial. This is because you often have years when their reproduction fails due to the climate and so nothing proves that it would be better with another partner. Generally it is the male who guards the nest. So if the female dies, the male finds another female for his nest, and if the male dies the female finds another male and moves to his nest. This leads to social behavioural traits, can you see them? Anne D. : They recognise each other by their calls. There are many different calls which have different meanings. There is a collective defence. There are so many collective things, like searching for food. So, if on one hand there is a hunt for berries and insects, the prize is individual where each has their own booty; on the other hand, food of a human origin induces a lot more competition between individuals because it is exceptional and plentiful, things which they cannot all eat together. Therefore they fight a lot more than in their natural habitats. This creates a lot more competition and confrontation. And so, there is a hierarchy which comes into play. For example, the males dominate the females so they approach a picnic first. In general the female waits and the males try to send the others away. This takes a lot of their energy and a lot of time. So the females can group together quite fast in order to have something. So there are strategies for accessing food which are quite amusing to watch. They also hide food, this is something we have studied with British researchers from Cambridge University who are specialists in intelligence amongst birds. 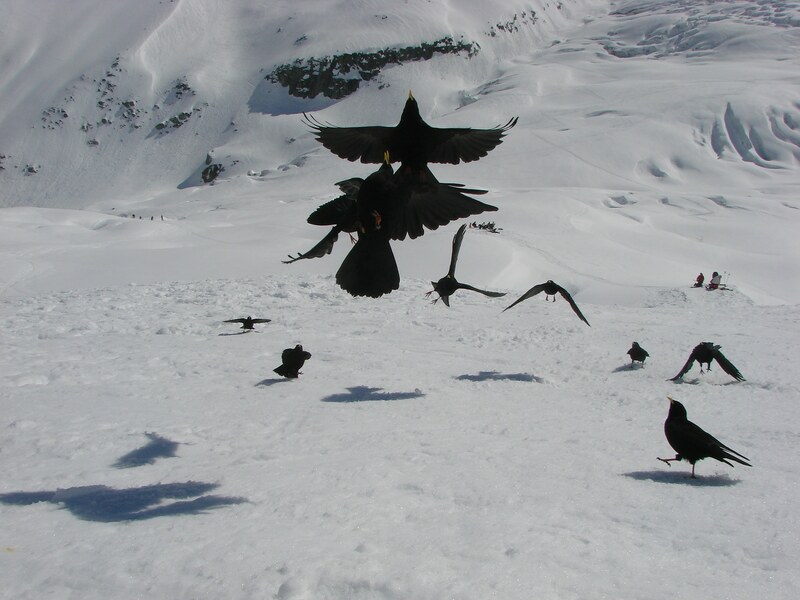 The choughs show this behaviour when they have a lot of food. They hide their food and then look to see if the others have seen them, in which case they change their hiding place. This means that they are aware of what they are in the process of doing, which is incredible. Not all birds do this, not even all animals, far from it. So the awareness of another, the regard of another, they understand, which is already really smart. On the other hand, we don’t know if they are capable of finding their hiding place again. How is their territory defined ? Anne D. : Once they have chosen, basically at around 2 years old, they install themselves in a group of adults and then stay in that zone for the rest of their lives. They are never going to go anywhere else. Those who live in the Aiguilles Rouges massif are never going to go to the Mont-Blanc massif. None of those from the aiguille du Midi (massif of Mont Blanc, Ed.) are going to make the round trip to the Plan Plaz restaurant in winter (massif des Aiguilles Rouges, Ed.). But there are some who move between the two massifs. The only place you will find them is in the village of Le Tour (1462 metres altitude, where the two massifs come together Ed.). There you have more or less all the groups from the upper valley which find themselves in the meadows around the village. Have you noted a change since you started to observe them? Anne D. : Yes, today, they go as far as onto the balconies of dwellings in Argentière. At the beginning of my studies, they never did that. It is around 10 or 15 years since they have been going to Argentière (1250 metres). You really see an evolution of behaviour in relation to human activity. People put more and more things on their balconies because they want to watch them. The birds have understood and now, the phenomena has amplified throughout the village. So, they can completely change and adapt themselves according to the situation. They are very adaptable. It’s smart, understanding how to find new resources and how to use them. Talking about adapting, how are they doing in relation to climate change ? Anne D. : It seem that they are adapting well. The only evident thing that I have observed is a shift in breeding patterns. From the point of view of the season, since I have been studying them, they have advanced their breeding date by around ten days. They feed a lot on grubs at the edges on the névés in the spring before they nest. So, they are completely reliant on this snow melt the date of a big production of larvae and insects. This implies a shift in breeding and so effectively we see a change of fewer than 10 days over 25 years. It is a lot, but it follows the evolution of their surroundings, the date of the snow melt and the vegetation which grows more quickly. They, from this point of view, have managed to adapt; which isn’t the case for all species. Afterwards, for the future, there is a very marked level of global warming in Chamonix, which effects the evolution of the moorland. For that which is blueberry, rhododendron they are going to climb higher and higher, while the grasslands which they eat the most are going diminish in size. Because, after all, the Mont-Blanc massif is very steep, so there are not grasslands up to 4000m and all the same they do depend on the grassland. For sure the blueberries suit them in autumn, but I don’t think that they constitute a sufficient resource. So, for the chough, I don’t think that climate change is a great upheaval. 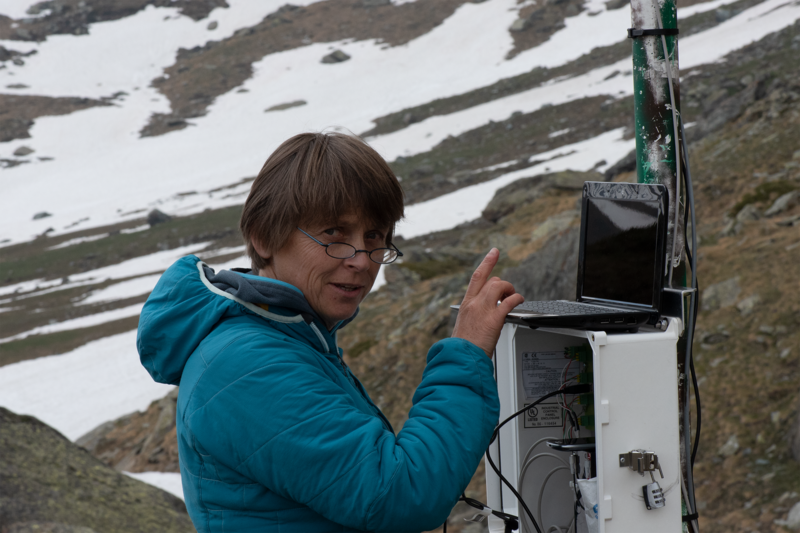 In 2050 however, when the change becomes more notable and the alpine grasslands have diminished yet further, we don’t really know what is going to happen. 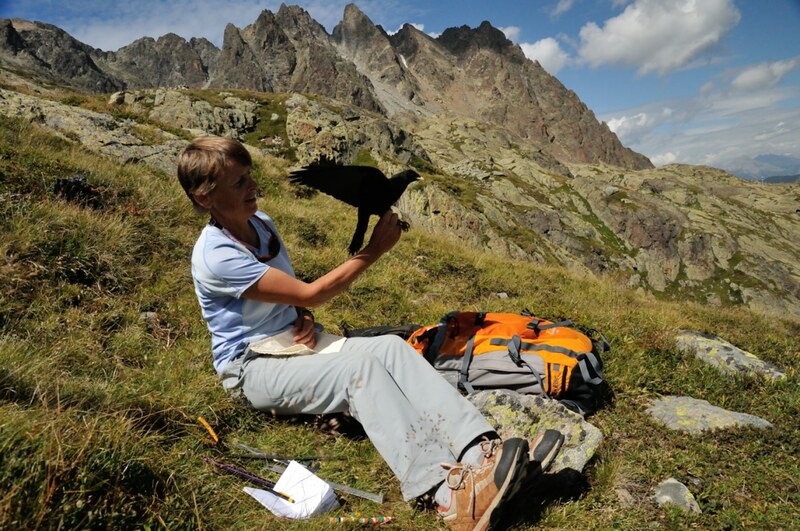 Is climate change leading other birds to go up into the choughs’ territory? Anne D. : The carrion crow is going up to higher and higher altitudes. And when they are in big flocks of non-breeding birds – the other day I saw around sixty in the Balme area (around 2000 metres altitude Ed. ) – that is a big crowd. One might have thought that they were a flock of choughs, but no. 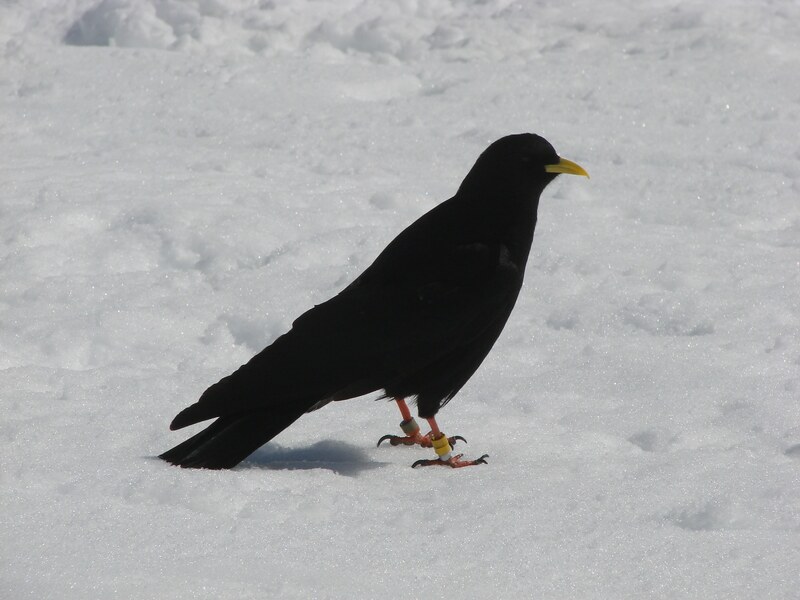 If the flocks of non breeders who also adapt to human food are high, the choughs won’t like it. So there is competition, and if the choughs don’t go down to the plains it is also due to competitors. Because, like pigeons, we see a large number in certain towns during the winter. In Switzerland, you can see them on the balconies in Martigny (471 metres) and Montreux (390 metres). In France, not so much, I don’t know why. But I think the reason that we don’t see them on the grasslands near towns, is due to competition with other corvids and other birds in general. Otherwise they could adapt very well to towns. They are a little like the cliffs. It is the same type of verticality and they could fly easily. It would suit them well. Concerning their agility, is it a bird that flies particularly well ? Anne D. : It has the best flight which exists. It has a silhouette which is made for flying and it uses very little energy for moving about. This is also an important point in its specificities because it allows it to make long ascents/descents and exploit a whole range of different places on the same day. That is also one of its specificities which enables it to stay in a hostile environment. Thanks to its capacities for flight, it enables it to use very little energy and cover a whole range of different zones according to the orientation. Are there not other birds who live at this altitude ? Eagles for example ? Anne D. : Truly, eagles don’t live high-up, they travel around high up, but they nest below a thousand metres. But they go higher up to eat, they hunt marmots in the alpine grassland, but their nest is always lower than their hunting zone so that they they can return to the nest with their food. Otherwise there are small passerines who also live high up, but not all year. All year round it is the only one. 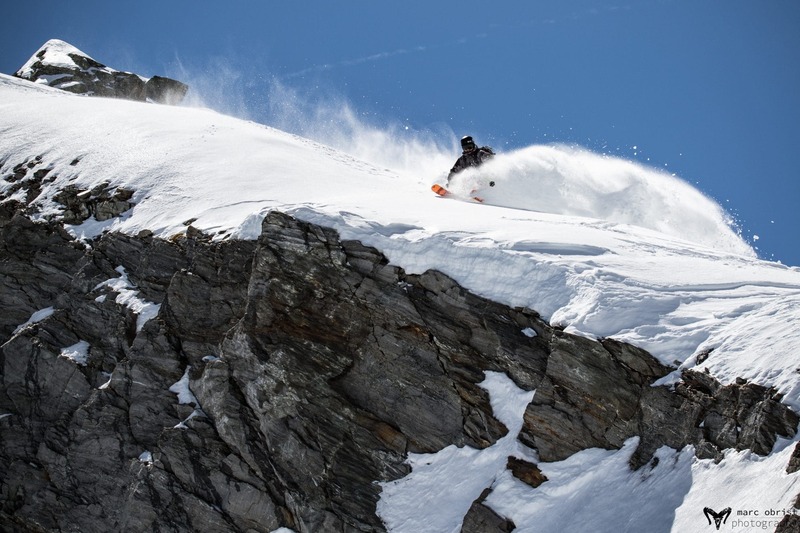 In the mountains they go where they want, to the summit of Mont-Blanc. In the Himalaya, they have been seen at very high altitudes. In winter, what do they do ? Anne D. : They also have a super plumage and they have plenty of down for facing the winter. Each evening they go back up to the dormitories and into rock cavities for shelter. They stay grouped and they keep warm. And, every morning, they go back down. For example, those that I follow in the village of le Tour sleep at 3000 metres in dormitories and they go down around 1500 metres to look for food in the village. Afterwards they hang around in open zones, in fields or on cliffs. The each evening, they go back up. It’s due to their quality of flight, otherwise it wouldn’t be possible. Where do the non-breeders nest ? How do they get by, especially in winter ? Anne D. : By definition the non-breeders don’t nest but they sleep together in cavities called dormitories not only in winter but also in summer. So the breeders are in their nests in summer and in dormitories during the winter. 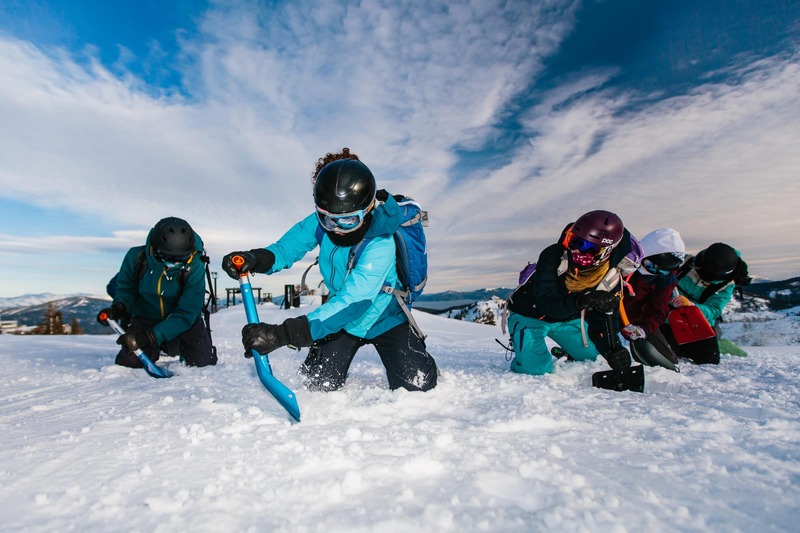 Safe As Clinics: female skiers are taking safety into hand.